After completing the checkout process you’ll receive an automated email from us with your order confirmation. Please keep this email for your reference. It will contain your order number and your order details. If you didn’t receive the email confirmation, please check your spam folder and confirm your email was entered correctly. Our specialists will thoroughly review your order. We will make sure your selections, address and payment are correct. If we have concerns or questions we will email or call you. Within one business day, we will prepare and email you drawings that illustrate your pre-hanging selections. 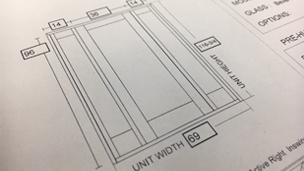 Our drawings will also include frame size and door swing. Please review the drawings thoroughly and notify us within 24 hours if you find any issues with the order. Please note: If you didn’t select to have your door(s) pre-hung we will not send any drawings. Production starts immediately after we review and approve the order. Once production pulls the door(s) off the shelf including all the parts needed, we will notify you via email (typically within 2-3 days) of the estimated shipping date. We work closely with our vendors to ensure orders are shipped on time. In the event of any delays we will notify you as soon as possible. Please note: once your order is in production we will not be able to make any changes to the order. 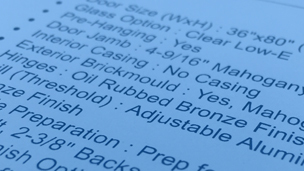 Once production is complete, quality control will re-check the order prior to packaging. Quality control will ensure the door, frame and hardware are all included and perform as they should. Door(s) are shipped on a solid and secure crate. The crate is designed to protect your door(s) and to ensure that it will arrive in perfect condition. Once the order is safely packed, we will arrange with the shipping company to pick up the order. We will then notify you via email with the specific delivery details such as freight company name and tracking number. We only ship with freight companies who provide our customers with an online tracking system and superior service. Once the order arrives to the local terminal in your area, the shipping company will contact you directly to schedule date and time of delivery. Someone must be on site to receive and inspect the order at time of delivery. All orders are delivered curb side on a truck with a liftgate. Please follow the delivery instructions provided by us included in the email sent when order ships. Any special delivery needs should be arranged prior to production. Still need help? find out more on our support page!